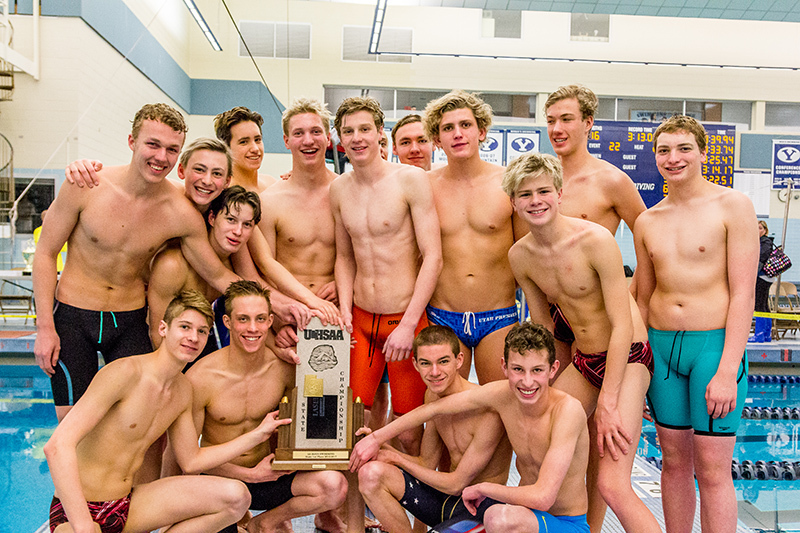 The Park City High School boys swim team poses with the UHSAA 3A State Championship trophy after taking first at the championship meet over the weekend at Brigham Young University. A state championship is the ultimate goal for a lot of high school athletes. 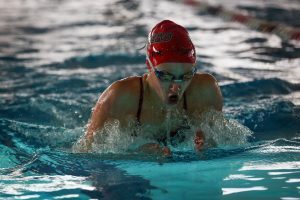 But for Park City High School swimmers Rozie Selznick and Joelle Hess, winning the state championship this weekend was the expectation, not the objective. In 2014, as a freshman at the state championships, Selznick collected two gold medals, along with a silver and a bronze, while fellow underclassmen Hess took home two golds and a silver. Both athletes were crucial in earning the girls’ program the state title that year. Three years later at the same pool at Brigham Young University for the 2017 UHSAA 3A State Championships, Selznick and Hess grabbed four gold medals each, helping this year’s version of the team earn yet another state title. The girls’ swim team compiled 466 points en route to the championship, the program’s fourth in a row. The boys’ team followed suit with 369 points, which was good enough to secure its own state championship. Like their female counterparts, it was the Miners’ fourth-straight 3A state title. 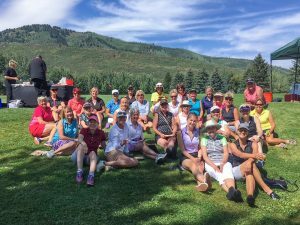 Finishing behind Park City on the girls’ side of things was Desert Hills with 275 points, while Cedar City claimed third with 238. For the boys, it was reversed, as Cedar City finished in second place with 256.5 points and Desert Hills finished in third with 208 points. 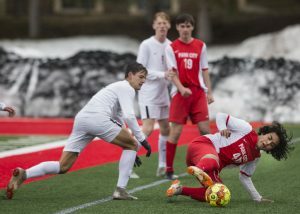 For the seniors who have been with the team all the way through high school, like Selznick and Hess, they’ve never not known what it’s like to win it all by season’s end. Though all of them mean something, this final title might just mean the most. 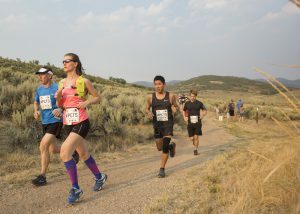 Between the two teams, the Miners, individually and on relays, walked away from the state championships with 14 gold medals, seven silver ones and two bronze. Leading the way for the girls’ team was Selznick, who upped her career individual state title total to 14 over the weekend with her four golds. Hess’ four gold medals were equally, if not more, impressive, which included two state record-breaking performances in the 100-yard breaststroke and the 200-yard medley relay. Elise Beller also added three more gold medals to the total with wins in the 200 free, 500 free and 400 free relay. Katie Hale rounded out the winning efforts with a gold in the 100-yard backstroke, while she also earned a silver medal in the 100-yard butterfly. On the boys’ side, the Miners were led by Cole Peterson, who nabbed two individual golds in the 200-yard IM and the 100-yard backstroke; and Alex Yokubison, who secured a first-place finish in the 100-yard freestyle, as well as a silver in the 200-yard freestyle. The two also joined Dennis Djunic and Quentin Tyler in the 200-yard medley and 400-yard freestyle relays in their gold-medal performances. Djunic finished second to Yokubison in the 100 free, making that his second silver medal of the weekend (50 free). Tyler (100 back) and Jack Trixel (500 free) were also able to secure silver medals for Park City. Selznick ended up winning the 3A Swimmer of the Year Award, while Yokubison and Peterson shared the title for the boys. When asked what the secret is, Werner said the Miners just knew what time it was. 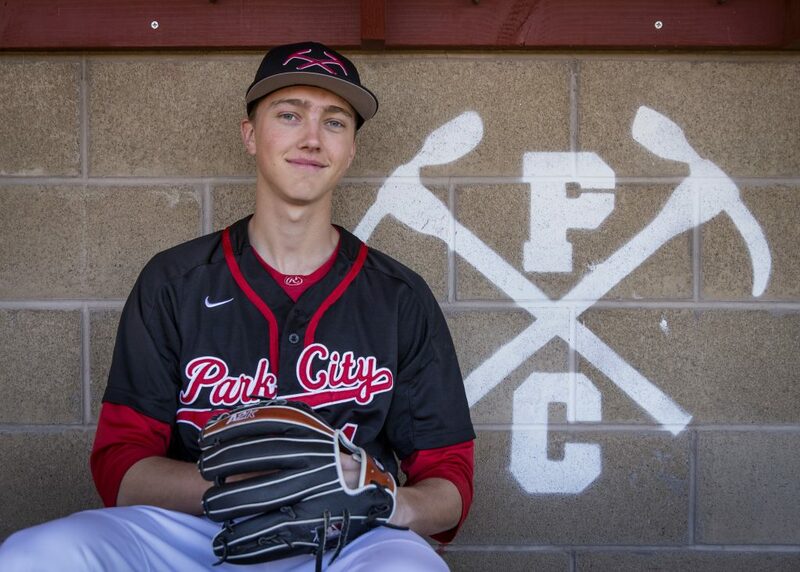 With another season come and gone and another title earned, PCHS will experience turnover in the offseason. The Miners, however, like to reload rather than rebuild, like they have each of the last four seasons.